Very impressive...I'm gonna post a report with many pics about it in a few weeks! I'll start this out with "Nr. 110" by Peter Heinrichs (all Peter Heinrichs blends are produced by Kohlhase & Kopp) and many of them are also available in US-Shops like smokingpipes and P&C etc., just like DTM blends. The appearance is delightful as a goddess, "Tiger-Flake" - two very dark brown stripes with straight out black parts in it frame a medium brown stripe, that has golden parts in it. Very well crafted, this is tempting as a flake can be! It resembles "Bengal Slices", but only in the look, as Bengal was an English blend with Latakia iirc. Nr. 110s smell from the pale white, nothing fancy, almost boring designed tin is decently sweetish, with hints of nuts and chocolate to it. A slight spice is lurking, that will make it's presence known in the taste very well. Best to fold and "wrap" the inner stripe with the two outer, dark stripes. Just stack those in the bowl, as they are pretty short, almost square. Could take some drying time, but also lights well out of the tin, even tho you have to run a pipe cleaner through the shank whilst smoking once or twice. 30-60mins should do the trick, just experiment with your gusto! Oh....the taste...the taste is so delicious and in total harmony! First off: This has a ever present, yet very mild honey-sweet tone to it along with a chocolaty and walnut-like topping which is very tasty and enhancing the natural tobacco aromas, but never subdues the rich tobaccos. This is once a again a blend where the flavouring underscores the natural tobacco taste and seems very natural because of this. Tobacco with complementary flavouring - not flavouring with added tobaccos! They really hit the sweet-spot here. There is plenty of intense and refined spice from the Kentucky. Full-bodied pepper, decently woodsy- and earthy. The Burley contribute to the walnuty topping, by giving pleasant nutty notes, as well as they support the Kentuckys natural and tangy spice. The Virginias play a minor role, and seem to carry a bit of honey-sweet notes with hints of bread. But it's really barely detectable. Very well done, the added flavours aren't "on top" of the tobacco taste, but melt into a melange of intense and rich nuts, chocolate, earth and woodsy spice. Creamy and satisfying smoke. Wow, I like this a lot! Once it gets some age to it, the anyway light handed applied topping fades a bit and the rich spice intensifies. Strenght-wise it's a solid medium and very well suitable for the first smoke of the day, as well as what people consider "All-Day-Smoke". Back in the days I rated this 3/4 stars von TR.com, yet this is a 4/4 star worthy blend, not only because it fits my personal taste so good. No. 110 is both pleasing to look at, as well as pretty damn delicious and exactly what I was looking for: An "All-Day"-suitable Kentucky forward blend, that doesn't only have Kentucky in the description, but full-bodied flavour in the taste. Slightly reminds of a more spicy, less flavoured version of Amphora Full. Chapeau! This is something special! Hope you guys enjoy reading about those german blends, at least I enjoy writing these reviews! Thanks for an in-depth review! I really enjoyed your descriptions of the flavors. IMO pipe smoking is all about critical tasting, and I find your ability to identify and verbalize those sensations most edifying. Thank you Deniz for your continuous work in popularizing well crafted and high-end German Tobaccoes.Much appreciated. thank you Cortz and Paulie! Really appreciate those kind words. Makes me happy you guys appreciate it. As long as you guys are interest in german blends, I'll keep em coming. My first pipe tobacco ever was "No. 14" by Heinrichs, a Vanilla aro with Old-Belt. Pretty nice, I had 100g an still have about 50g, as I only smoke it rarely, but it's a nice tobacco for starting out! The "Reserve Crue" and "Crue Pierre Henri" lines are also pretty good. RC has a excellent Latakia flake f.e. as well as a Perique and VA flake. Crue Pierre I only know No. 2 myself, which is just as good as the RC line ones! Somehow these haven't come to my attention, and they sound very good, as do other of their blends at SPC. Thank you for introducing me to these. Many of the less mentioned brands sound sort of interesting, but the specs don't entice so much after you read about them. These sound distinct and high quality and are not beyond affordable. So thanks again! Another thing worth mentioning: "Dark Strong Flake" is a match to Orliks Dark Strong Kentucky, which seemingly comes pretty close to the originial (i diddn't got to taste the original so I can't comment on that). Today I wanna review "Curly Special", which is also available at smokingpipesdotcom, and quite surprised me today, as it's damn close to one of my favorite blends. I also noticed that I got over 10 "helpful" votes on TR.com, which all have to be from last night - thank you guys, I'm happy my work is appreciated. Rare Virginias are spun into "twist" then sliced to the size of small coins. Each disk is a complete blend. Costly to produce, this spun cut can be smoked for its slow burning classic Virginia flavor or mixed into a favorite blend for a change of pace. If I wouldn't know better, I'd think this is OLD LOUISIANA MIXTURE by Motzek. Got a generous sample of this, and the first thought when taking a sniff on the backy is "this is Old Louisiana?!?!" OLM has some Burley and Cavendish in it too, but really, the smell is EXACT the same. The taste differs a bit, but we'll get to that later. Not to be confused with "Curly Block", this is a different blend. The smell from the bag is buttery, spicy with hints of pepper and a gentle sourness. The Curlys are beautiful and well crafted, and copious present. Only a few ribbons of loose tobacco to be found. Pleasure to pack, easy to light, needs some relights but rather good burning characteristics imo. Curly Special's taste is 90% like Motzeks Old Louisiana Mixture! The Virginias and Perique melt into a surprisingly different flavour, than you'd expect from your average Va/Per. This isn't fruity, like a lot of Perique blends are. It's deep spicy. Good pepper from the Perique melts with the buttery, decently earthy and only slightly sweet Virginias. Also hints of raisins can be found, which I think are from the Perique. Like OLM this is VERY buttery in taste, very rich and refined. A tad of nuttiness is also present throughout the smoke, but not as intense as in OLM. Taste-wise, OLM ad Curly Special are REALLY(!) close to eachother, and if I wouldn't know better, I'd think this is the exact same mixture. Heinrichs gets their blends are mainl produced by K&K (Curly Block f.e. is produced by Mac Baren), but Motzek produces them themselves, so it can't be that they're the same. For my personal taste I find Old Louisiana Mix a tad better than Curly Special, as it's a whiff more butter and also has a more nutty quality to it. Curly Special is like a slightly toned down version of OLM, which doesn't have to fear the comparison to OLM at all! A top-notch, sophisticated and genuine blend, that's far from your average Va/Per expierience and most natural in taste. It (just like OLM) taste like pure tobacco, not even honey, nor sugar to be found in the taste. A must try, for any Va/Per lover! A great introduction into the world of Perique for any novice. one more, for today! "Reserve Crue No. 9" (Va/Per with Orientals) must wait a few more days for it's review, as my sample was pretty dry (and pretty nice aged!!) and was harsh by times. I'm currently rehydrating it and come to a final conclusion after I smoked it hydrated. The first flake tobacco, which is spicy without any latakia added to it, and which still is mild to the tongue. Virginia and Kentucky round off this new taste. Today I revisited this tobacco , as I took a sample of it with me the last time I vistited Peter Heinrichs shop. Somehow I must've forgotten, I've already had this tobacco in the past Back then I was lacking words to describe what I tasted, and described it as "pure tobacco taste" - which still is true as it can be! Yet I wanna try to get a grasp on the flavour and sat down to ruminate about it's flavour profile. If I had only read the description on the website, I had thought twice about buying this tobacco. Doesn't sound bad - but also like nothing special - really a bland tobacco description, which is in line with the pale white, no design tins of Peter Heinrichs. Luckily it's about the TASTE, and I instantly wanted to try this tobacco, as I took a sniff out of the tin in the Shop of Peter Heinrichs in Bergheim, Germany. 223's smell when unburnt is a astonishment, as it smells pretty close to a straight VA, or Orliks Golden Sliced f.e. No Kentucky to be found in the smell, but a refreshing citrusy and slightly sweet scent is spoiling your nose. The flake comes rather on the dry side, in perfect smoking condition. Takes the fire well, stays lit perfectly, burns flawless. No. 223s taste is very natural and true to the word "tobacco"! On first light I perceive a slightly citrusy-sweet aroma, before a bready note, reminding of full-rye-bread joins in. The Kentucky is a minor player, but helps adding depth and body to the blend. It has a decently nutty quality, which hamonizes perfectly with the bready taste of the Virginias. Also peppery spice, that's a tad earthy. A very mild honey-ish sweetness is always present. Virginia and Kentucky fuse into one, and result in a genuine flavour-profile, which is uncomplicated, unspoiled, and rather simple. Yet it has enough depth and spice to it and isn't boring, nor one-dimensional at all. Sometimes less is more! No. 223 is the proof for it, with it's simple composition and spartanic description. It's very bready, and tobacco-ey taste is simple, yet tastily with a solid body and a natural charm. A 4/4 stars worthy blend, that's surprising you with very natural tobacco-goodness. Virginia spiced with Kentucky in just the right ratio to create a unique blend, that is very suitable as an "All-Day-Smoke" to both, the straight Virginia lover, who like a tad more spice as a change of pace, as well as the Kentucky lover, who likes a all-day-suitable Kentucky blend, that can also be enjoyed after breakfast, without being overwhelming. If you guys have any specific Heinrichs blend, you'd like to read a review about just suggest them and I'll get a sample of them next time I'm at his shop. Have a nice week, and decelerate from this insane meritocracy, by taking your time for a pipe (or two...or three ) by times! I'm happy to share this wonderful hobby passion with you folks! yep, it's comparable to Old Gowrie, Paulie! Even tho it's missing the slight fruit note of the Perique, that Gowrie has. As you're Scandinavian you can order directly from PH's site, only America isn't possible, it sadly states on PHs side. But SmokingPipes has pretty much the a collection of the finest PH blends to offer! Report how you did like it Paul! This is the EXACT same blend as the old recipe of Scottish Flake, just an uncut version. Peter Heinrichs also validated that. After contacting K&K two times and asking if the recipe for Scottish Flake changed (it's Va/Per/Ky with Rum now) and not getting any clear answer - furthermore the 2nd time I asked they completly denied it ever was a Va/Carolina/Turkish Havana/Kentucky blend - I simply asked the guy from Peter Heinrichs. Why would they (K&K) do so? Somebody must be lying obviously as Crue No. 6 and my tin of Scottish Flake (of which Peter Heinrichs has a few left) ain't got any Perique in it, nor a Rum-flavouring, that's a sure thing. 100% there's Oriental in it. Hell even the description on the tin says "Va, Carolina, KY, Turkish Havana"...who they trying to fool? And why? K&K is a giant in the branch, still I prefer the transparancy, personal contact and honesty from smaller producers like Motzek, HU or other smaller comapnies, who involve their customers, rather than not even being able to tell the ingridients of a blend for sure. Peter Heinrichs get's their tobaccos from Kohlhase & Kopp, who also produces McConnells tobaccos. He assured me this they changed the blend and Reserve Crue No. 6 is exactly this old incarnation of Scottish Flake. Just look at the description: Every single word is the same! I compared Reserve Crue No. 6 with Scottish Flake and feel confident to say: It is the old Scottish Flake recipe for sure. The plug is has delightful appereance, with ranging colors from golden-yellow, to medium-brow and orange speckles. I find the plug to have an advantage to Scottish FLAKES flake cut. The flavours a tad more intense and darker, deeper. Lights easy, need average relights and smokes well, after at least 30mins of drying-time. Reserve Crue No. 6's (or Scottish Flakes uncut version if you will) taste is very sophisticated and refined. Not comparable to Scottish CAKE at all. It provides a intense fruity aroma at first light, which I perceive as being orangy, with plums and figs. Quickly the Turkish makes it's presence known by contributing a very herbal, dry and woodsy aroma, with a tad of sourness that's enriching the fruity component (which I guess is the Red Virginias?) excellently. I also get a nuttiness that's lurking in the back, which is very pleasant and consitent throughout the smoke. The Kentucky is applied rather light handed, and contributes a decent smoky, nicely tangy spice to the blend, as well as it emphasizes the Turkish very well. A peppery spice is constantly present and makes this blend full-bodied and rich. Lots of earthy and woodsy notes in interplay with the softly sweet, but intense fruity component of this smoke, form a melange that's bewitching and taking you to foreign lands of the Orient. No doubt - this is a TOP-NOTCH blend, and quickly became one of my "Choose 5 tobaccos for an lonley Island"-tobaccos. It has the EXACT same flavour. The only difference is that it is a plug-cut (so a un-cut flake). The price of 17,10€ for 100g has a slight advantage of 9,40€ for a 50g tin of Scottish Flake. The fact that it's a plug is also advantage to me, as I enjoy the preparation a lot. I'll be sticking to Reserve Crue No. 6 as it's a tad cheaper than Scottish Flake, just as I find the plug-cut to be superior and a whiff more intense in flavour than the flake-cut version. Also the stock of old-recipe tins at Peter Heinrichs will run out soon and not many other shops offer the old-recipe. If I were to choose 5 tobaccos for living on a lonley Island Reserve Crue No. 6 would be one of them without thinking twice. This herb is divine. Oh by the way: Can anyone explain me what "Turkish-Havana" is? Do they mean "Turkish and Havana-Leaf" or is "Havana" a varietal of Turkish? It may be there's Havana (cigar?) leaf in it, as it is creamy and rich like a cigar to some degree. But I'm not sure about that. some more, but rather briefly reviewed blends, which I gathered to recommend to mso, so I thought I'll post them here, too. - "Old Kentucky Flake" is very close to Old dark Fired and they also had a Orlik Kentucky match, which is now out of prouction sadly. You should be on commission, after reading your reviews I ordered 3 different heinrichs blends. hehe, makes me happy you were inspired to try some tobaccos from a pipe shop, that has a long tradition here, Peter Heinrichs himeself was a exceptionel personality. A buisnessman through and through, but with a open heart to anybody who got to meet him. May he rest in Piece. I think some of his success relys on the fact he's offering something for anybode. Cigars, Cigarillos, Pipe tobacco, even his own cigarette blends, pipes, accessoires for both pipes and cigar, they virtually got anything a tobacco smoker could wish for. 2 shops in Cologne and Bergheim (where I live, it's close to Cologne). One is called "House of the 10.000 pipes" (nowadays its even more than 10k..it's insane!). What blends did you order? Never forget to ask for 3 samples, almost all german shops offer that. Just add it as notice to your order which blends. Hope you like them and thanks for the positive feedback. Great, great reviews, Deniz. Thank you. Have you tried Reserve Cru No. 2? It's becoming a favorite of mine. Strong orange scent in the tin (bag), but very well balanced in the bowl. The three I ordered were Dark strong flake , curly special and curly block . I wonder how long heinrichs will be available in the United States , seems that these small tobacco blenders are disappearing and becoming unavailable at an alarming rate . Dang woodsroad : I was considering that one too, the US options are limited , I shy away from tobaccos that have vanilla in the description , is the vanilla in the background or prominent ?? In addition to Reserve Cru No2. I'm also curious about Reserve Crue No. 4 as they both sound great. Alan, I didn't pick up on vanilla in the No.2. In fact, I didn't read that description untill after I had smoked a few bowls, and it just doesn't jibe with my perceptions. Maybe it's me. Got a new one due to my recent shopping spree at Peter Heinrichs Chateau Henri in Bergheim. and a sweet pipe. Butz Choquin Rondello II discounted from 80€ down to 29€! "The star in this mixture is the finest perique, extended by six different Virginia leafs that got dark fired, and a pinch of Oriental. Carefully processed into flake form and packed by hand. Highly aromatic pleasure with the typical perique character." Previously I had tried a sample of this excellent, genuine flake. My sample had some serious age to it I guess, as it had LOTS of crystals and was pretty damn dry. After hydrating it, I was impressed by the unique character of this blend, so I bought a tin of it and am now writing an more in-depth review. Opening the nondescript tin, with the inconspicuous design of which more(!!) than the half label is the damn warning sticker these days........, I find a lovely and classy golden sticker in form of a tobacco leaf that's for closing the greaseproof paper (similar to the ones for packing breads for school or work) inside the tin. All Reserve Crue blends have it. I can't remember, but somebody once told me which manufacturer uses those golden-leaf stickers, and based on the revenue stamp it's not produced by K&K, who produces almost all P. Heinrichs blends. Inside there are two stacks of small almost square slices that are cut at about 2mm thickness. It's easy to identify the dark fired (Virginia) leaf in it, as the flakes are very dark. Black, dark brown, some brighter brown speckles and only very few, small dots of golden-yellow. The tin note is intriguingly piquant-fruity. A decent smokiness forms the base of the scent, accompanied by a fruity, slightly sour aroma with mild, honeyish sweetness to it. You can also identify the Orientas clearly scent-wise, as they offer a distinctive woodsy-sour, very herbal, decently ethereal aroma. Complex tin note, that makes you want to load a bowlful. The tobacco itself needs 30mins up to 1-2 hours of drying time, depending on personal preference. Yet it is smokeable right out of the tin. On first light I got hit by a rich nuttiness that is underscored by decent woody and earthy undertones. After a few puffs the Perique makes its presence known by contributing a slightly fermented fruity aroma, reminiscent of figs, dates and maybe a whiff of ripe oranges. Intensly earthy, with a good share of woody-smokiness to it. Very piquant and peppery, herbal spice to it. Ethereal in character. The rich fruitiness and the tasty nuttiness are married in perfect harmony and complement one another excellently. It's like raisins and nuts - they just harmonize so well! Underscored by the ethereal, herbal, and smoky-spiciness this is a unique blend with a genuine aroma to it. At half-way through the bowl the fruity,herbal and nuttydimensions are tamed just a bit and make room for the smoky, woody and peppery sides of this blend shine a tad more. Smokes cool, doesn't bite and if smoked at moderate pace it never gets harsh. Highly enjoyable, it has a very "exotic and oriental" feeling to it. The aromas of this blend are unlike most other Va/Per blends, and convince with its genuine flavor profile that's taking you to fairytales of 1001 nights! After having digged into the first tin of this, I have no doubts left: This is a high-class blend, that's genuine, complex and very sophisticated! Highly recommended for Va/Per lovers who like a Oriental touch to the blend, as well as to English- and Oriental smokers, who like an exotic extension for their rotation. wow that sounds great. Thanks for the update. Just spent the last hour or so at peterheinrichs filling a shopping cart only to get a message at checkout that the majority of the products "were not available for my country." On my last visit I grabbed three new samples. No. 30 (Va/Per/Lat Curly), No. 43 (Va,Java,B.Cav), No. 154 (Bu/Ky/Va) are the samples, and the first one is already reviewed. A select combination of 1 mm broad, long fibrous Burley and Kentucky and 3 mm broad, canary yellow Virginia. By this composition a tobacco was created, which is burning down more evenly and slowly, also the tobacco obtained into smaller bowls of a pipe. Pleasantly mild and easy. A unspectacular looking mixture. My sample baggie was really full, due to the light weight of the ribbons. Dominated by medium-brown ribbons, and speckled with bright-yellow and very few black ribbons. Dipping my nose into the sample baggie I get a unconspiciuous scent. Very tobacco-y, little spice, and most certainly a whiff of a casing or topping of some sort. What makes me sure is this "slightly danish" undertone in the odor. Honey-ish, sweetish, but not obtrusive and hardly to notice this seems to be a rather natural tobacco. Packing is a breeze, like with any ribbon cut mixture. First light did hit me with a very tobacco-y, intensly nutty and slightly earthy aroma. After tamping, and making the "true light" a simple, yet natural and delightful aroma is building up. The earthiness intensifies just a bit, and settles for an mild earthy tone that's underscoring the very tobacco-y and rich nutty aroma of the Burley and Kentucky leafs. The Virginia sports slight citrusy-sweetness to round any rough edges. There's also a very mild honey-ish sweetness, which may come from a casing, but it really just enhances the natural sweetness, without seeming artificial at all. By times I also get some chocolaty notes out of it. A very pleasant, uncomplicated and most all-day-suitable smoke! The strenght is pretty tamed in comparison with other Burley-/Kentucky-forward blends, which makes it very digestible. 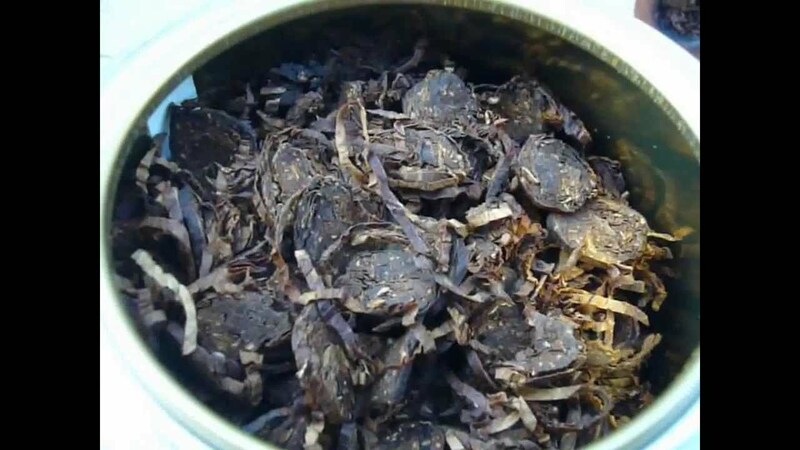 Not the most complex, nor the most sophisticated blend, but a solid-as-rock, no-nonsense, and natural pipe tobacco blend, that will appeal to any Burley and Kentucky leaf lover and fans of natural mixtures. Easily 3/4 stars defining it with TobaccoReviews rating. I don't "have to have" a tin asap, but I certainly would pick up a tin of it by times. "A dark, spicy, mild Virginia Kentucky-Flake. An alternative for Engish-smokers." I grabbed a sample of CH 44 about 4-5 months ago. Opening the baggie today the tobacco was still dripping moist! Hints towards there being quite a lot additives in it that keep it moist. Not a plus for me, as it's straight up unsmokeable in this condition. 3-4 hours of drying at fresh air helps and makes it perfectly smokeable. The scent of the unburnt tobacco is dark breadish, underscored with honey and very little citrus. All in all a hearthy aroma. The flakes are rather dark brown with very few bright speckles. There's quite a bit of Kentucky in it I'd suppose and the VAs used were either stoved or they used dark VAs. Lighting it up in one of my beloved clays I liked what I smoked. Very(!) bread-ish, reminiscent of dark- and whole-rye-bread, that's underscored with a bit of nutty-sweet, and molasses by the Kentucky in it. A minor grassy and slightly citrusy aroma is whirling in the back of the flavor-profile and help balancing the bold power of the other components, with their "dark character". A very flavorful smoke, and definetly an "All-Day-Alternative" not only for english-smokers, but also for people who like blends like Old Dark Fired, Bold Kentucky or other (df) Kentucky forward blends and look for a digestible all-day smoke of that kind. Can smoke quite hot, best to be sipped very slow (or air breaht method, as I do) to get most flavors out, prevent bite and avoid harsh spots. I have a feeling this could be Solanis Silver Flake, just in another package (both from K&K; Heinrichs sells a lot of blend from other brands under their label with different names). I haven't got my hand on Silver Flake so for, but I'll update as soon as I have. Definetly worth trying, not the most "deep" nor complex blend, but a flavorful extension for the Kentucky-lovers tobacco bar, or an mild (more surroundings-friendly) alternative for the English mans dash of Latakia bombs. Have a nice sunday folks! A connoisseur's natural blend of Virginia and Curly Cut, with Perique and Syrian Latakia to enhance the taste but not overwhelm. Round, full flavor for sophisticated pipe smokers, yet a pleasant, classical "tobacco shop" aroma. Again, I'm not really a English smoker and only like English blends with very little (syrian) Latakia in it. So again take this review with a grain of salt, as I'm not to versed on English blends with Latakia. But on my last visit at Peter Heinrichs I've felt like grabbing a sample of this. Curly Cut...Perique...just very little syrian(!) Latakia...what could go wrong? Well...nothing! This blend is quite a pleasant surprise to me and I enjoy it a lot. Sticking my nose into the sample baggie, I perceive a lot of Latakia, which first scared me, but the fear was for no reason after I smoked it. Woodsy, dry and smoky notes from the Latakia, underscored with little sourness from the Perique. A tad of sweetness in the back. The Curly Cuts are intriguing, mostly brown with some black speckles in them. Brown- and bright brown to yellow leaf dominates the apperance of this tobacco, and only very little black speckles are in it. First light reveals that this blend contains a little more Latakia than I'm used to, but not too much that it would turn me off, like "full grown" English blends with high Latakia amount would. The Latakia instantly offers a creamy, almost buttery smoky, woodsy, sour and dry aroma and gives body to the blend. The Perique is barely detectable and only sports a slight (pleasant) sourness that's in the back underscoring the Latakia very well along with minor fruity notes of figs. Virginias are more prominent and offer citrusy-sweetness, and a bit of grassiness. It almost feels like there are Oriental leafs in it, but I guess that's the interplay of Latakia and Perique creating a dry, sour and woodsy aroma. It has decent (also slightly peppery) spice to it, which makes it a nice treat after a good meal! Pleasantly mellow, with the Latakia taking more of a backseat as the bowl progresses. I'd describe this blend as "mild English" and a nice entree-level blend for pipe smokers who want to dig into English/Latakia blends. Pretty similar to Motzeks "Old Curly Mixture" - not only because both contain Curly Coins in it. I actually enjoyed this blend a lot and by times I'll pick up a tin of it I guess! Confused by the rather low ratings, I'll give this a 3.5/4 stars rating to support this lovely (both in taste and appearance/craftsmanship) blend and say: "Hey...this is a delicious smoke! Go try it if you can!" Now a nice sunday to yall!